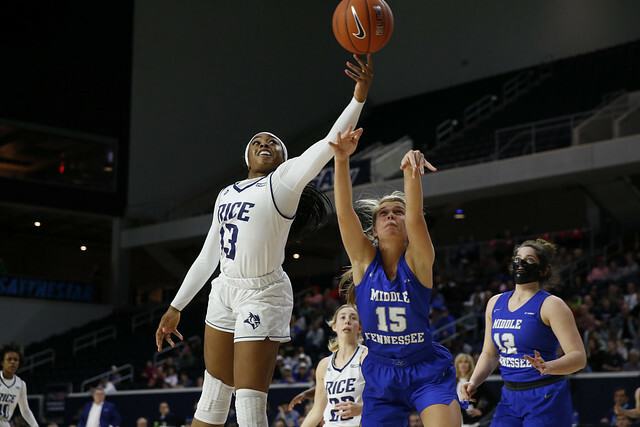 All season long, the Rice women’s basketball team stuck to its motto of one game at a time, and the idea that the biggest game of the season was the one in front of them. So when the Middle Tennessee Lady Raiders led by 10 points at halftime of the Conference USA (C-USA) Tournament championship game, there was no panic. Instead, the 24th-ranked Owls went to work in the second half, outscoring the Lady Raiders 43-20 to win the program’s first-ever C-USA Tournament title 69-54 in Frisco, Texas. Rice (28-3), which earned an automatic bid to the NCAA Tournament and will enter on a 21-game winning streak, is the first team in C-USA history to go undefeated in league play during the regular season and also win the conference tournament. The C-USA tournament title is Rice’s second-ever postseason conference crown, joining the 2005 WAC-winning team. The Owls are making their third NCAA Tournament appearance. “We’re really proud to do this for Rice,” head coach Tina Langley said. “We’re a nationally and universally respected university. We wanted to help the basketball program to be as respected as the university is, led by a great president. To perform on the basketball court the way we are right now and to have to do the work in the classroom every day takes an exceptional student-athlete. We knew it would happen in time if we had the right student-athletes to build that culture of wanting to be great in both aspects. Sophomore center and C-USA Defensive Player of the Year Nancy Mulkey, who was named tournament MVP after averaging 18 points and 5.7 blocked shots in the Owls’ three games in Frisco, led the way in the final with a game-high 24 points on 9-of-20 shooting and set a title-game record with eight blocks in 34 minutes of action. Mulkey has 89 blocks this season, breaking the Rice single-season record previously held by Lauren Neaves (83). Junior guard and C-USA Player of the Year Erica Ogwumike, who joined Mulkey on the all-tournament team, scored 15 points to go along with five rebounds and a pair of assists in the final. Freshman Jasmine Smith and senior Nicole Iademarco added 10 points apiece. Rice ended the game on a 38-15 run after Middle Tennessee led 39-31 with 6:48 left in the third quarter. Rice held a slim three-point lead entering the final four minutes before scoring 15 of the game’s final 18 points. The Owls went 10 for 10 from the free throw line in the fourth quarter as part of a 19-for-21 effort for the game. In the second half, Rice outrebounded Middle Tennessee 21-10 and outscored the Lady Raiders 13-2 on second-chance points. Update: The Owls moved up in the national rankings to No. 21 on March 18. They will face 18th-ranked Marquette in the first round of the NCAA Tournament at 1 p.m. Friday in College Station (Texas A&M). The game will be televised on ESPN2. Scroll over the image to click between photos.